The previous post applies Evidence Based Creative Teaching (EBCT) to the design and facilitation of blended learning. This should be easy to follow and make good sense, provided you have fully digested the previous posts’ content—have you? In this final post of this series on EBCT, I offer my frame on how to develop Creative Teaching Competence, both at the Individual and Institutional level. Expertise requires considerable effort and perseverance over time, with estimates of 10,000 hours as ‘the magic number with guided practice’ regardless of a person’s natural aptitude, popularized by Gladwell (2008). With enough practice, he claimed that anyone could achieve a level of proficiency that would rival that of a professional. It was just a matter of putting in the time, around 10 years. However, the view of 10,000 hours for developing high level expertise has been challenged (e.g., Goleman, 2013; Epstein, 2014). This is not surprising as expertise in different areas may not be equated so precisely in such algorithmic terms. Furthermore, there is practice and deliberate practice, so it is probably the case that some individuals are using qualitatively different practice activities, some favouring (or hindering) the route to expertise. Also, there are likely to be constitutional factors (e.g., psychological, physical) that come into play along the journey to expertise, as we are not born with a ‘Blank Slate’ as Pinker (2003) so comprehensively documented. Finally, but very importantly, the quality of the teacher or coach will have a very significant impact on the rate and effectiveness of learning. In summary, on the question of how much time is necessary to develop expertise, there are certainly no ‘quick fixes’ and it will involve much time and commitment, but 10,000 hours may be more of a metaphor than an evidence-based heuristic. For me, it is not so much the number of hours it takes to become an expert, but more the specific ways in which aspects of the learning experience are approached and structured. Firstly, interest and motivation are of key importance. For teachers, this is likely to vary, as for any occupational or professional group, as some may want to achieve the very highest levels of professional performance, while others may be content with a solid basic competence. In the context of teaching, a whole host of factors can influence a teacher’s motivational stances to professional development. These may include individual perceptions of the value and usefulness of professional development activities to the real world of the classroom and the practices of teaching. Equally, institutional support and the perceived value placed on professional development by senior management will also influence the amount of time and effort that teachers may give to such activity. For example, I have rarely visited an educational institution that does not claim to value professional development for teachers. However, this is not always the experience of many teachers in terms of the rewards systems, whether in terms of financial or status benefits. Also, teachers have lives outside work and, for some, family time or other interests may take a strong precedent over the amount of effort given to ‘professional development’. In the final analysis, despite factors that may support or inhibit professional development, it is the individual’s own sense of purpose and desire to become a creative teacher (as framed in this context) that is of most importance. For highly motivated teaching professionals, the application of EBCT practices and principles represents the Pedagogic Literacy, the rest is personal motivation and volition. At the institutional level, there needs to be a strategy to develop what Hargreaves and Fullan (2012) refer to as Professional Capital (essentially a situation in which an institution-wide expertise has been attained and integrated as everyday practices for a designated capability (i.e., creative teaching competence)). Typically, in any institution, when there is a new innovation in the field, there are some faculty (usually a minority) who, through their own motivation and volition, develop expertise in this area; what Hargreaves and Fullan refer to as Human Capital. Over time, often through sharing platforms and/or institutional encouragement/pressure, there develops Social Capital, a situation in which an increasing number of faculty are developing expertise, but only in certain segments of the institution. If an institution seeks to achieve Professional Capital in Creative Teaching Competence (or other desired expertise capability), a clearly articulated evidence-based plan for developing it is needed. This is traditionally seen as the function of professional development, though historically there have been extensive excursions through Educational Jurassic Park. inspire staff and can even reinvigorate quite jaded teachers. The results and impact of examples of Supported Experiments in the context of applying EBCT to Flipped Classroom learning were initially presented in Creative Teaching: An Evidence-Based Approach (Sale, Springer, 2015) and extensively documented at the Redesigning Pedagogy International Conference, National Institute of Education, Singapore (May 31-June 2, 2017). This is very much collaborated by my 25 years or so experiences in faculty development (Sale, 2015) where I consistently noted that underperforming teachers (based on student feedback over consecutive semesters and observation) rate their teaching in more positive terms than high performing observed teachers; the latter being much more critical, identifying specific aspects of strategy and practice that could be improved in future. The usefulness of reflecting on one’s practice, depend on what constitute the content and processes that are analysed and evaluated in such reflection. Without strong knowledge bases relating to what constitutes effective practices and the underpinning learning science there is likely to be a very limited analysis of the lesson, invalid inferences and interpretations of what is actually happening in class, and subsequent poor evaluation of events. An Evidence-Based approach to Reflective Practice is first and foremost grounded in the thoughtful application of the EBCT practices and principles. It then involves, through a process of analysis and evaluation of the lesson experience, making sense of valid inferences and interpretations of what has occurred in a learning event (e.g., lesson, workshop) and the likely salient events that may have structured significant aspects of the student experience. From this basis it is possible to make, as far as is possible, an accurate diagnosis of the learning event in terms of its impact on student learning (both positive and less positive), as well as a better predictive capability for future sessions (e.g., what methods might work better and how best to implement them in this or similar situated contexts). Invariably, feedback from students as well as from expert/experienced peers, adds validity and usefulness to an evidence-based approach to reflective practice. 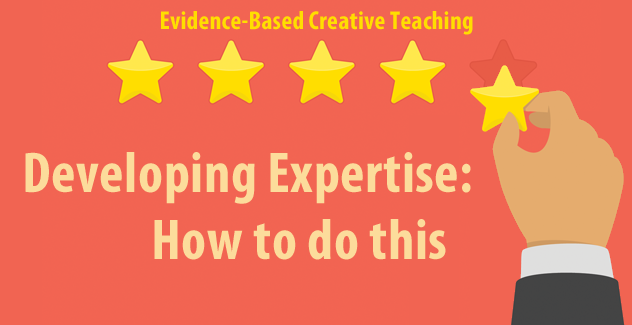 In Creative Teaching: An Evidence-Based Approach, my aim was to provide a total pedagogic framework to enable motivated teaching and training professionals to teach more creatively. I deliberately wrote the book in a more informal narrative style than is typical of work in this genre, cognitive science, in-order to make it an interesting read to accommodate both those who like the full evidence base as well as others whose specific interest is to understand what works, and why. In this series of blog posts, my first ever, I have tried to employ a similar approach, providing the meaty science and practical applications, but maintaining the informal narrative. Darling-Hammond et al., (2009) Professional Learning in the Learning Profession: A Status Report on Teacher Development in the United States and Abroad. National Staff Development Council. Epstein, D., (2014) the Sports Gene: Inside the Science of Extraordinary Athletic Performance. Penguin, London, England. Gladwell, M., (2008) Outliers: The Story of Success. Little, Brown and Company, New York. Goleman, D., (2013) Focus: The Hidden Driver of Excellence. HarperCollins, New York. Gulamhussein, A., (2013) Teaching The Teachers: Effective Professional Development in an Era of High Stakes Accountability. National School Boards Association, Centre for Public Education. Joyce, B. R. and Showers, B., (2002) Student Achievement Through Staff Development, 3rd Edition. ASCD, Alexandria, CA. Pinker, S., (2003) the Blank Slate: The Modern Denial of Human Nature. Penguin, London. Research Alert (2014) Educational Leadership May 2014, vol 71 No 8. Professional Learning Reimagined. (http://www.ascd.org/publications/educational-leadership/may14/vol71/num08/Double-Take.aspx). Timperley, H., Wilson, A., Barrar, H., & Fung, I., (2008) ‘Best Evidence Synthesis on Professional Learning and Development’. Report to the Ministry of Education, Wellington, New Zealand.